Our trip to Egypt took place in Nov. of 2009 so it was before the recent uprising and the ouster of Mubarak. It was with great fascination that we listened about damage to a mummy in the Museum, having been there just a short time ago. Now that these changes have occurred there, we've wondered how it has affected our guide, a local woman who had already given up wearing the traditional buraqa, keeping her head totally bare, without any type of head covering. 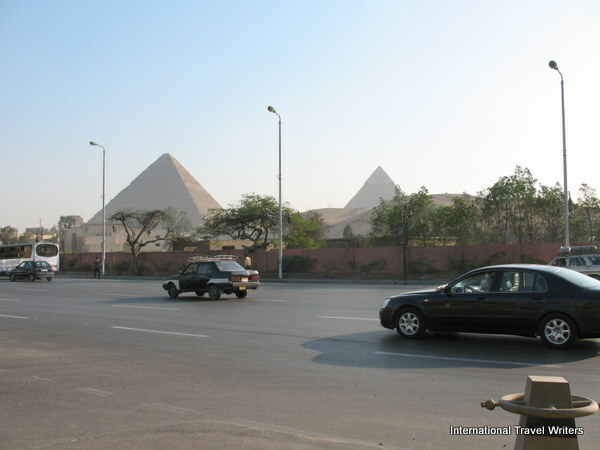 The largest city in Egypt is Cairo, a city that straddles time, spanning the dawn of civilization to the present. Ancient pyramids, historic mosques, Coptic churches, and medieval architecture of Old Cairo to modern Tahrir Square, home of the Egyptian Museum and American University in Cairo, all eras are represented in this amazing city. 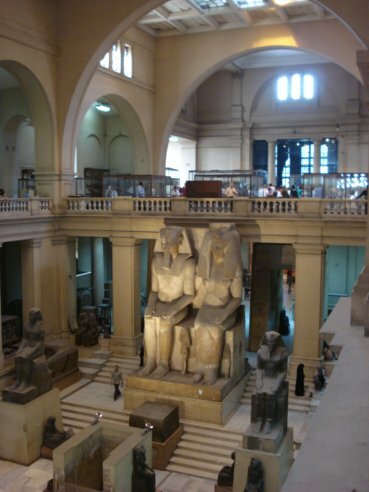 The museum houses the richest collection of antiquities, including the magnificent Tutankhamen collection. More of Egypt still awaited us so after breakfast and checking out of the hotel we got on the bus and headed south on the blacktopped, modern road to the first Egyptian capital of Memphis. 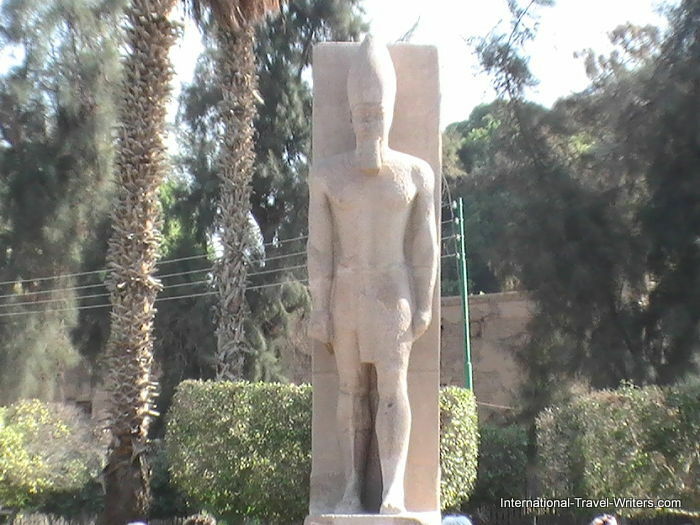 The Temple of Ptah, the fallen colossal statue of Ramesses II and the Alabaster Sphinx of King Amenophis II were ahead. Following would be the Giza Plateau, to gaze in stunned reverence at the only remaining Wonder of the Ancient World...the astonishing and beguiling Pyramids of Giza. Because these are in full view from the local highway, an aura, a weird sense of the past blending into your current day permeates your inner compass. Exploring Egypt's Great Pyramids of Giza and the mysterious Sphinx is a trip well worth taking. The bus unloaded us at the lower area of the Giza plateau and the number of tour buses was amazing. 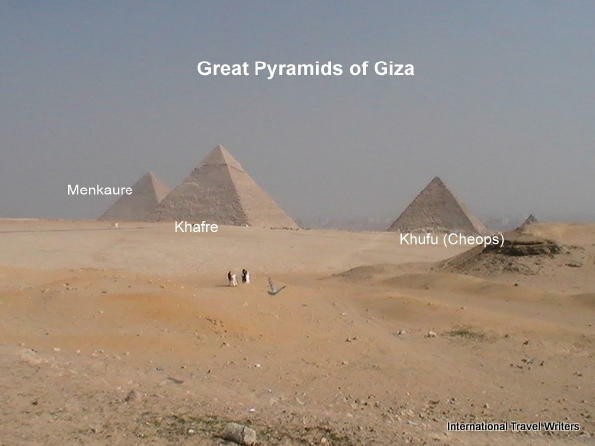 There are three major pyramids : Great Pyramid of Giza, also called the Pyramid of Khufu (Cheops, ca.2600-2550 B.C.) is approx. 481 feet tall, Pyramid of Khafre (Chefren, ca. 2575-2520 B.C.) is approx. 471 feet tall, and Pyramid of Menkaure (Mycerinus, ca.2520-2490 B.C.) is approx. 213 feet tall.